Cheezyn.pk - It is the biggest online store in Pakistan, with an extensive range of products, and the only store in Pakistan catering to all age groups. Initially starting as a wholesale business, we realized we wanted to provide the same products at the same reduced price to everyone, and not just retailers. We deliver products at home, without any cost, via Leopard Courier. The mission is simple: we want to provide the best to our consumers. 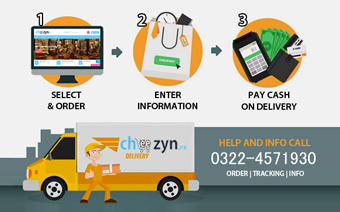 Cheezyn.pk wants its customers to have an amazing online shopping experience; an experience better than onsite shopping, which is why we are offering a broad variety of products, so that a customer can find everything they want at one place.